Michele has started her Rikke hat in MarigoldJen DK Weight BFL (her Rav page here). 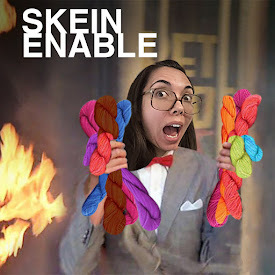 Michele used a video from Knittables (Knitabulls?) about garter stitch in the round. Jill couldn't find it to link here, so here's a different tutorial. 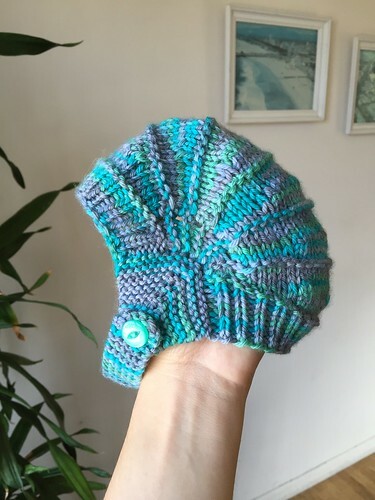 Jill finished her newborn Aviatrix hat by Justine Turner in Nerd Girl Yarns Clever (her project page here). She is still working on the #15 Banded Lace Pullover by Traci Bunkers from Vogue Spring/Summer 2016 in Cascade Avalon. She is 30% through her Inara Wrap by Ambah O'Brien out of two Artyarns Milano Fade gradients in Hematite Fade and Malachite Fade. Michele is into the 3-in-1 sweater and the Stripes with a Twist pattern, both by atelier alfa. Michele also likes the Gunmetal Shawlette by Mam'zelle Flo (which reminds Jill of patterns by busylittlemonkey) and A Little of This, a Little of That crocheted shawl by Teri DiLibero. Jill has bought some Ysolda Teague patterns: Wee Carson and the Rhinebeck Sweater book. She wants to make Pumpkin Ale, Aunt Fred and Jenny at the Fair. She also like the Manatee pattern by Rachel Borello Carroll. Also check out her other Yarnigans patterns, including the Dutch Rabbits and Marisol the Knitted Mouse. Gooey Butter Cake - here's a link to the history plus fancy recipe. The cheater recipe Jill uses is similar to this one.